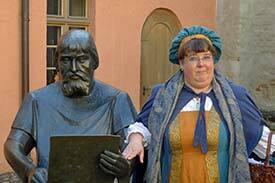 ABOVE: Bettina Brett, an Engish-speaking tour guide, poses with a statue of Martin Luther's friend and portrait artist, Lucas Cranach the Elder. The Schlosskirche, a.k.a. the Castle Church that belonged to the Elector of Saxony, is where Martin Luther jump-started the Reformation by nailing his 95 Theses to the church doors. Note: You can climb 289 stairs to the Schlossturm viewing platform next to the church, but you won't be walking in Luther's footsteps: The tower was added in 1892 and restored in 2005. A few blocks away (and just behind Wittenberg's marketplace) is the Stadtkirche, or Town and Parish Church of St. Mary, where Luther preached. It's the oldest building in Wittenberg, dating back to 1280. Many of its pre-Reformation artworks were destroyed by the Iconoclasts in 1522, and its most impressive interior feature--the Reformation Altar--was painted in 1547 by Lucas Cranach the Elder, who was a court painter to the Electors of Saxony and a friend of Martin Luther. Wander into the courtyard, admire the Cranach statue, and visit the Historic Printing Shop where master printer Andreas Meschke (inset photo) makes prints and cards with a hand-operated letterpress. A second Cranach House at Markt 4 has a permanent exhibition devoted to Cranach the Elder. For more information about the artist(s) and the two courtyards, visit the Cranach Foundation's Web site. I haven't visited the House of History (Schlossstrasse 6), but the city tourist office bills it as "a journey into the past" with a "Living in the GDR" exhibit and special exhibitions. The Hundertwasser School is a once-bland GDR building from the 1970s that was given a fanciful facelift by artists and children under the direction of Friedensreich Hunderwasser in the 1990s. The school has inexpensive tours in German and English. The Werksiedlung Piesteritz was built in 1916 as a housing estate for factory workers. It was created by a German town planner and a Swiss architect, and in recent years the site has been turned into a car-free community. Wittenberg also has one of Germany's smallest zoos, the Tierpark Wittenberg, within the former town walls. About 20 minutes from Wittenberg, the Alaris Schmetterlings Park is a tropical environment with hundreds of free-flying butterflies from around the world. 1st, 3rd, 8th inset photos: TourismusRegion Wittenberg.